Few musicians today possess so much awareness and experience with the music of Luigi Boccherini as Emilio Moreno, or can invest their performances with so much insight. 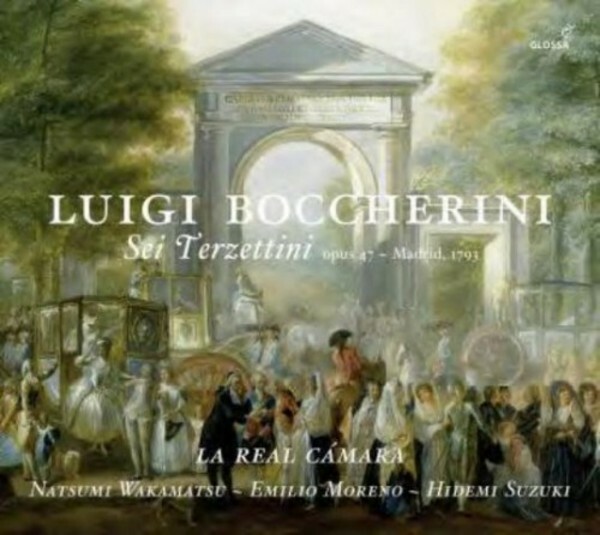 With his ensemble La Real C�mara and for his seventh recording of Boccherini�s music for Glossa, Moreno has now turned to the set of six string trios or Terzettini, Op.47 � scored untypically for Boccherini for violin, viola and cello � written when he was in full maturity both in his compositional activity and in his own skills as a cellist. The year was 1793 and Boccherini turned 50 at the start of it. He had now been working in Madrid for some seven years after the death of his principal patron, the Infante Don Luis de Borb�n, remaining active as a composer (these Op.47 trios were dedicated to a new patron, the King of Prussia), cellist and conductor of various of the private orchestras then flourishing in the Spanish capital. His style had become tauter and more intense, almost Romantic in its expressiveness. Over the decades Moreno has played chamber works of 'Don Luis Boquerini' with many gifted musicians. Here, with La Real C�mara, he joins his own viola playing to that of two of his established colleagues and friends from Japan (the recording was made in Saitama), violinist Natsumi Wakamatsu and cellist Hidemi Suzuki. Emilio Moreno also provides a thoughtful essay about the composer as he turned 50 and about his music.